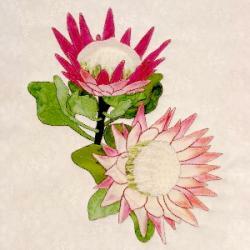 King Protea - new flower applique » What's Under the Needle? Congratulations go to Sue for suggesting the King Protea flower block. Our pattern will be coming your way. This block is a little more detailed than others I have made. There were lots of little pieces to cut out and fuse in place, however, the pattern gives you some simplified options so it may not be as difficult as it looks. Read on for some additional helpful tips that you can apply to any fusible web applique. Have you ever cut out tiny pieces? Probably the hardest thing is to get the paper backing off but not so much if you lift the paper halfway off before starting to cut. You don't want to lift it completely off otherwise it becomes difficult to cut out following the template, but if you do it part way, the drawing doesn't move and you have a starting point where the paper is lifted. 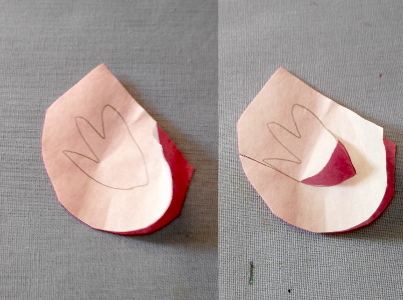 When you lift the paper halfway, make sure you cut the lifted area first and finish in an area that is still attached. This prevents the whole backing paper moving and falling off completely before you get finished. 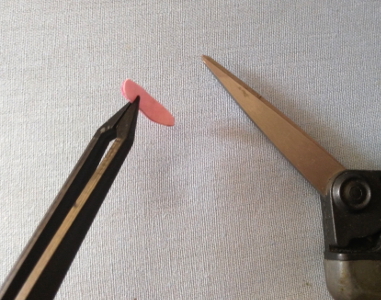 I also use tweezers for those really tiny pieces when I need to. And of course, you know small sharp pointed scissors are the best job for these. When it comes to selecting threads, aim to match your fabrics for the applique stitching. The thread will be less visible that way and blend into the fabric rather than stand out from it and a great way to obscure those mistakes - yes we all make them! If you cannot match the fabric, then it is best to go slightly darker than it is to go slightly lighter. Lighter threads tend to make a statement and glare out - of course, if you can stitch perfectly, that won't matter. I prefer to use a thinner thread in the bobbin. 60 weight is great. Remember the higher the number in weight, the finer the thread is. Tighten your bobbin thread slightly so that it pulls the top thread down and the bobbin thread isn't visible, that way you can use the same bobbin for all the stitching. 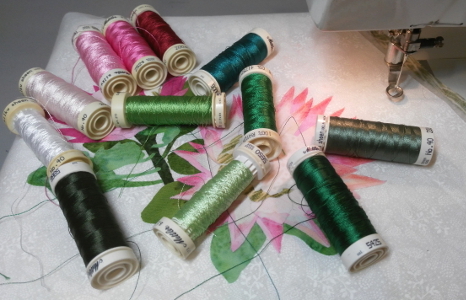 If the bobbin thread shows on the top, then try using a matching thread in both top and bobbin.